If you've been to this blog before you know that I am somewhat of a creature of habit when it comes to preparing my own food. I like food that is not only relatively quick to make, but also full flavored and nutritious (and interesting to make, too); this is a perfect example. It's a cross between a Spanish tortilla de huevos and an Italian fritatta (but closer to the Spanish version, I think). But as fancy as it sounds in romance languages this really is nothing more than a baked omelet. 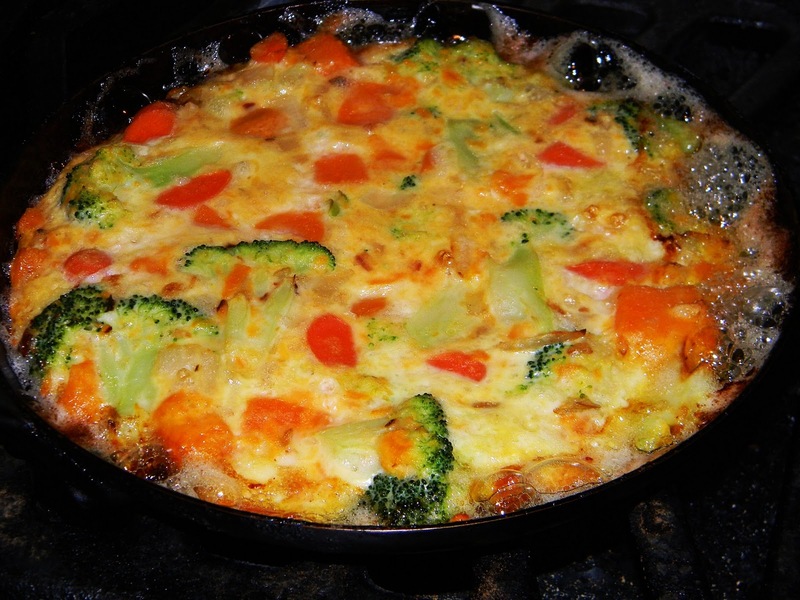 And what makes this so healthy is that it is chock full of vegetables...just enough egg to hold it all together. The real beauty of this dish is that there are no rules when it comes to its ingredients...anything goes (literally); it's a great way to use whatever you have on hand (my favorite way to cook). This is a variation on many versions of this recipe I've posted previously, but tonight I included--besides the eggs, of course--sweet potato, carrot, broccoli, cheddar, and a sort of sofrito made with onion, garlic, and hot pepper. Here's how to do it. Preheat your oven to 400F/204C; do this first so that it heats while you prepare your ingredients. Cook the vegetables; I steamed the carrots and broccoli and sauteed the onion mixture (the sweet potato was cooked from a previous meal). Mix everything together with the eggs, including the cheese. Heat a skillet on the stove top with a little olive oil. 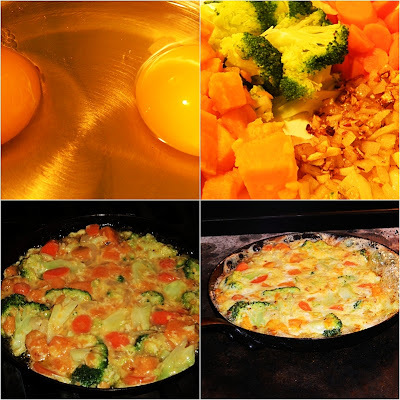 When it's hot add the vegetable-egg mixture, smooth it out with a spoon or spatula, and place the pan in the oven. By the time you pour a beverage and slice some bread it will be ready; if the oven was preheated it will cook in 5 or ten minutes. For more recipes like this, click here.